Capsule wardrobes are a bit of an obsession. Because of my minimalist and sustainable attitude toward fashion, I have been de-facto wearing a capsule wardrobe for years, but only recently did I vow to do the same for my kids. The most difficult to do this for was my newest son. Babies need a lot of clothes, right? My main goal is for less to be more. In a nutshell, it’s having a minimal wardrobe that is comprised of things that can be mixed and matched to create multiple looks. 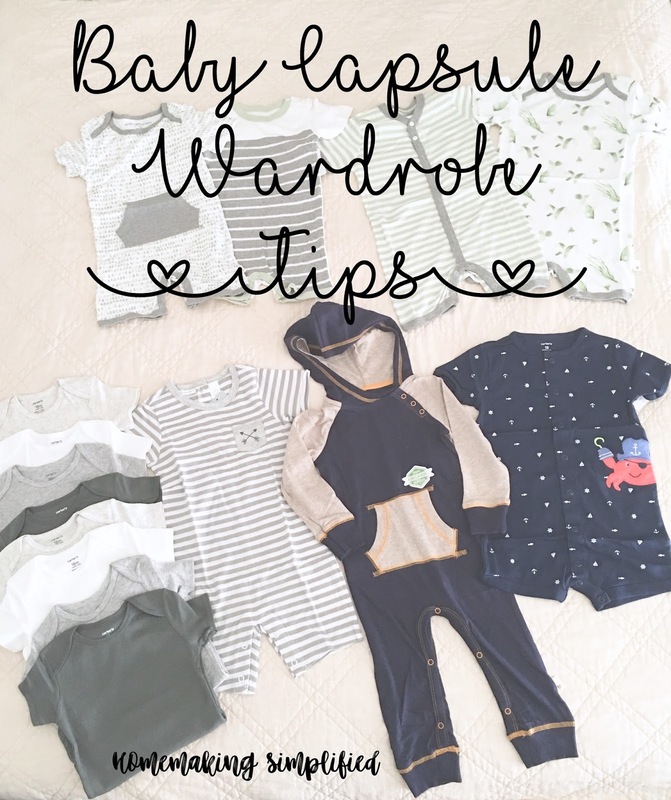 So when buying an item, you consider how it goes with everything else you have so that a new top doesn’t just get worn a time or two before being discarded, but instead, choosing classic and timeless pieces that work with most items. With our other kids I bought a lot of coordinating outfits. They were louder in style and the pants would only match with a specific romper and if the set bib got messy, baby either mismatched or needed a whole new outfit. We had SO much baby clothes!!! When it came time to save the girls' clothing for future kids, I had 4 bins filled with 3-4 vacuum sealed bags each of baby girl clothing. This was craziness! Now I buy individual pieces mostly comprised of solid colors and almost anything I pull from Paul's drawer will be a matching outfit. He has way less clothing, it’s better quality, and he always looks stylish. 🤗 I made him a capsule wardrobe from 6-12 months (some still fits) but this is his new wardrobe sized 18 months. I anticipate that this will fit him through next Spring. This is his new 18 month capsule. It's missing a pair of grow with me pants that I made him that are dark blue and an organic Burt's Bees reversible sweater from his Tia. Make every item a favorite item! If it's going to be a hot season, be sure to choose a warm item (like that long-sleeved pant romper) for over air-conditioned rooms, or cool nights as well as a sweater. Make sure you have enough outfits to go a week between washing. Even if you wash 3-6 times a week, you may have an out of town trip with no washer access, a broken machine, power outage, etc. Plan for the unplanned. Work with onesies--accessorize with bibs, hair bows, cute socks, soft soled shoes, etc.